This was so Telf, as we called him. A quiet, self-effacing man, he’d gone and died on us; been cremated; not even given us a chance to celebrate his life. It had been a long one. He’d made it to 94, quite an innings. 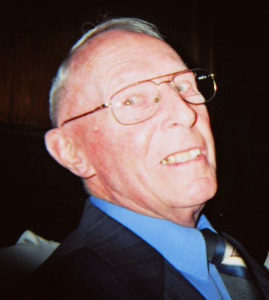 Born in England, Telf had served as a Royal Air Force pilot during the Second World War, delivering new aircraft from North America across the Atlantic. Later he had settled in Canada and become involved with the paper industry, specialising in the kraft paper used to make paper bags. It was in this capacity that I first met him almost 28 years ago. He was then the chairman of a small kraft paper mill group which would soon merge with another (containerboard). This broader group in turn would become part of a new body (the Packaging Mills Association of Canada) which later folded; most mill members then joining the current Canadian Corrugated and Containerboard Association (CCCA). Throughout this time, Telf was closely involved with the environmental arm of the industry, the Paper and Paperboard Packaging Environmental Council (PPEC). In fact, he and Irving Granovsky of Atlantic Packaging, hold the record for longest terms of service to the council; over 20 years. Telf’s major contribution to PPEC, apart from the deep industry knowledge that he willingly shared, was the compilation of industry statistics, particularly related to recycled content. It was his formative work that led to PPEC issuing a recycled content report every two years from 1990 onwards. This public tracking of the industry’s use of recycled content (which has jumped from an average of 47% back then to 77% today) was both educational and explanatory, and is frequently cited as an industry example to follow. Over the last 10 years, Telf reduced his unofficial involvement with the council but we kept in touch, most recently about three months ago when we lunched in Brampton. He had just successfully passed his driving test (at the age of 94) and insisted on driving from his home to the PPEC offices. Stubborn maybe. Independent. Definitely. With a weakness for apple pie and ice cream. Thanks for the contribution and the memories, Telf. 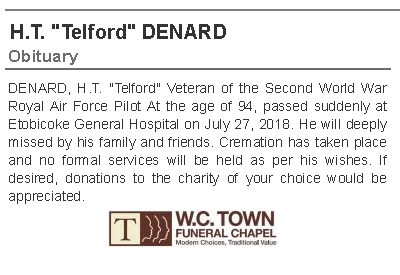 I will miss my God Father Telford (Telf) I will cherish the fond memories of visits to Farm in the Eastern Townships which he and my God mother Ethel facilitated over the years for our family as we rarely owned a car. But they were part of the family and and a great influence on my life and the whole family. Now who’s going to make the trifle.